When we are at work, we create a lot of “what if” scenarios. Should something go wrong, we have the process and procedures to deal with them. So, why not try the same thing in your personal life. Create a plan of action when negative thinking runs rampant or when an emotional crisis breaks out. 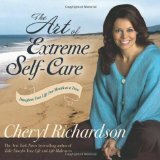 See below for a new kind of first-aid kit from Cheryl Richardson.